Ok I’ll just say it, moving is hard. But now I’m on the other side of the move and enjoying a coffee at my new kitchen island while writing this post. It’s all worth it in the end but there are a few things you can do to make the process a little less painful. Call me type A+ but we created a moving dashboard on Google Docs to keep track of all of the to-dos and assigned each task to a person. I also kept a running list of everything I was ordering for the new apartment, the cost + the shipping info and arrival date. 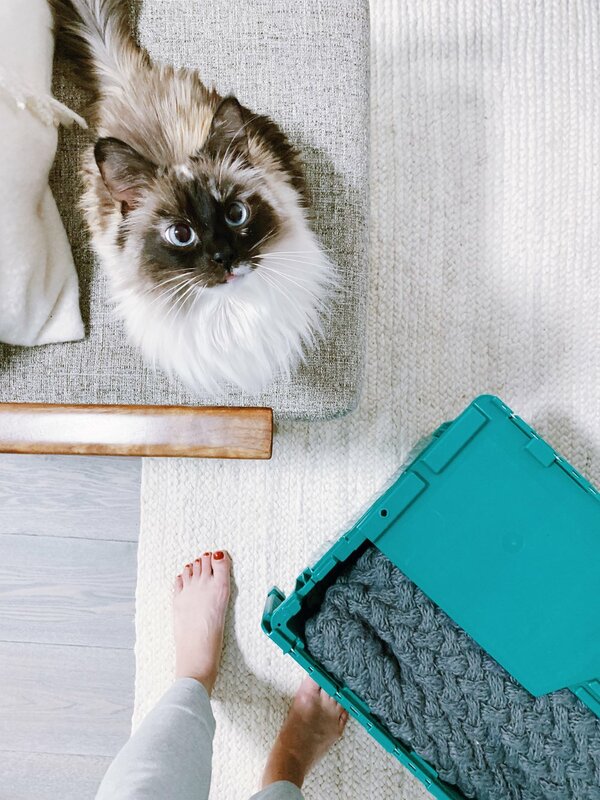 I based my list off of a few moving must-dos I found online and added a few of my own. I created a template of our list that I wanted to share with you, in the event you found it helpful. Click here for the template. I thought it was helpful in tracking all of those middle-of-the-night things you wake up and remind yourself to do. Something new that I did on this move was to rent storage bins. A wonderful local company called Zippgo let me try out their moving bins for this move. The bins turned out to be such a helpful element of the move. I scheduled the delivery online and they bring the bins right to your door. It’s as easy as opening up the door and wheeling a stack of them in. Then, I used the dolly to wheel the bins around the room, filling them up until they basically took over where my dining room used to be. Just to note, I decided on the one bedroom amount of boxes (25) because I do have quite a bit of stuff (sorry Marie Kondo) After the move, I scheduled them to come pick up the boxes and they came right to my door to wheel them away. No building boxes or breaking them down. Plus, their boxes can be used over and over again, making it better for the environment. If you are in SF, I highly recommend Zippgo and if you are elsewhere, make sure to look into renting bins. Ok, maybe not EVERYTHING but moving does really make you edit what you have. As previously mentioned, I have quite a bit of stuff but most of it does bring me joy. There were some things that I brought with me to the new apartment, that we will end up donating to the Goodwill but that’s ok. Unless you are moving from a mansion to a tiny home you probably will find room for things, or edit a little bit more when you get there. I can honestly say there is nothing I gave away that I still think of so be a little ruthless with what you keep and you will be happier in the long run. Unless you are moving out of your college dorm into your first apartment you need to hire a mover. This may me the top recommendation on this list to stay sane during the move. Yes, it’s nerve-wracking to have someone else load all of your worldly possessions into a truck and drive away BUT it is 1000% worth it not to have to schlep everything to your new place. Also, your friends aren’t professional movers and paying them in pizza just doesn’t cut it anymore. For your friendship sake and your mental sanity, get movers. When you are quoting movers, go with your gut and pay attention to who is getting back to you quickly and who seems like they are asking the right, detailed questions. We were SO happy with our movers, One Big Man One Truck. They had transparent pricing and were so careful during the move. While they were a little bit more expensive, they were still reasonable and worth it in the end. This is a super important one too. I packed up my kitchen things early which meant I had to eat out at every meal. That sounds like a luxury but I craved cooking something casual, and healthy in my kitchen. I also didn’t have time to workout amongst the packing so I felt guilty for not squeezing in workouts. I realize these are #firstworldproblems, but you have to take it easy on yourself and tell yourself that it really wont be like this forever. We were out of our boxes within two days after the move. This week (our first week in the apartment) I started cooking again and exercising. It will get back to normal again so just enjoy the last moments in your old apartment and the extra takeout during the week. So those are my five tips. Hopefully some of them are helpful to you if you are moving soon. It is a super exciting time so just enjoy the process (as hard as that can be) and be ok with a little messiness.